Much neater, easy to keep clean, good quality. This is by far the best water bowl we have owned. Someone would accidentally kick the old bowls and water would go everywhere. Now, the only time my kitchen floor gets wet is when I wash it on purpose. Love our pet bowls. Wish they had extra stainless bowls you can purchase. The company said they are working on it. We have 3 cats....they all mess with their stainless steel water bowl. Towels in the middle of the kitchen everyday. Until we got this water bowl...no more water on the floor! I no longer have to search for the dog bowl in the morning, it's right where I put it. It's easy to take out and into the holder. Additionally, I don't find it turned over when my puppy doesn't especially like what he's being fed.....that was a real bummer. 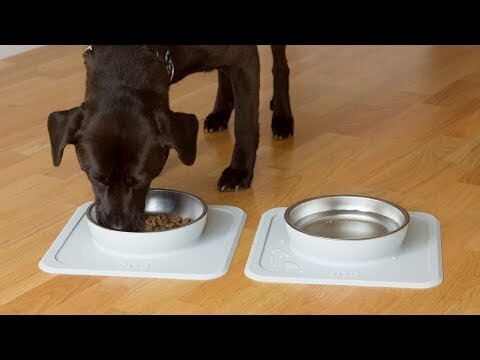 I highly recommend this if you have big dog sliding bowl problems or little dog dumping out problems; or if you just want a super easy way to handle feeding. I have purchased many dog food dishes and this one is the best by far. I know my dog likes it because it doesn't slid all over the kitchen floor. She can get every last bite without having to chase the bowl. It cleans up easily too! BEST DOG FOOD DISH. EVER. This is a great dish. My boys live it!! Great for a messy dog! I bought this for when my dog needs that drink at night ... I keep it in the bathroom. It's perfect for that small space by the door. It stays firmly in place, and looks great in the room! 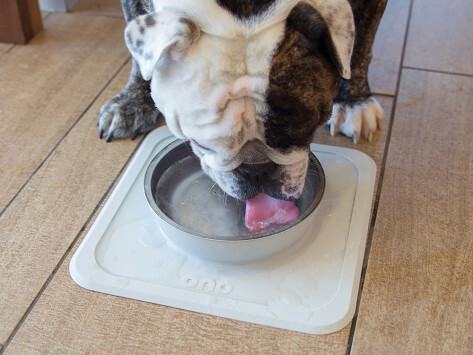 I must have the world's messiest drinker because the minute she took a drink the dribble extended past the mat! Well, at least I tried. One thing I would like, is the ability to order more bowls. I like to rotate my bowls ... one in the dishwasher while the other is being used. That would be my only drawback. A bonus for a puppy who likes to play in her water bowl!! Bought this for my daughter's dog when I saw the dog struggling with the dish she uses. Both daughter and dog are happier now.